Apartments in Ghaziabad | Saviour Builders Pvt. Ltd.
Raj Nagar Extension is a newly-developing residential sector that is suitable for middle-class homebuyers in the NCR. After Greater Noida West (Noida Extension), Raj Nagar Extension (RNE) on NH-58, under the jurisdiction of Ghaziabad, is developing as one of the most affordable destinations for middle-class homebuyers. RNE is a one-stop destination for a wide band of middle-class end users who have several options of purchase from construction-linked plan to ready-to-move plan. Here 2-, 3-, and 4 BHK flats are available in the price range of Rs 2,500-3,500 sq ft depending on the size of the property and its location. Builders who have already given possession or are giving possession in their projects include LandCraft, Ashiyana, SG Immersion, Ajnara Grace, Classic, Gulmohar, Devika Skypers, etc. Nearly 1,500-2,000 families have already moved into the finished projects here. RNE started off with 12 developers who came together and built the physical and social infrastructure and then went on to raise their projects here-today, the developing area has more than 30 developers. Many areas in the Delhi NCR came up with affordable-segment housing, but very few have been able to match up with the timely-delivery parameter. In around five years, RNE has more or less delivered on all the parameters. “Here the projects came up with the tagline of affordable luxury and we made sure that all the facilities come up on time, so that people who moved in here did not have to look to nearby developed urban centres for basic facilities,” a developer here said. Improving infrastructure: Keeping the demands and trends of contemporary living in mind, the consortium of builders has launched ultramodern projects in the luxury segment as well. Along with basic infrastructure in place, the area is well connected to Delhi and nearby NCR areas. The proposed Delhi Metro service from Dilshad Garden to Rithala, as well as a new substation, has been approved by the GDA. One of the major attractions of the developing area is the adjoining green belt, which will remain undisturbed because the GDA has declared 500 acres along the Hindon as a green belt and has banned construction activity in the area. 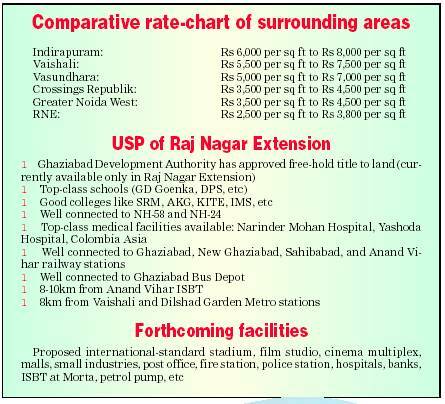 The area has got a boost with many projects lined up for improving the connectivity of the place: there is a plan to have a Metro station at Arthala—around 2km from RNE; the proposed Rapid Rail Transit System (RRTS) between New Delhi and Meerut will have station at Mohan Nagar—a few kilometers away from RNE. Under the RRTS project, stations are likely to be constructed at Anand Vihar, Vaishali, Mohan Nagar, Meerut Road (Airtel Cut), Duhai, Muradnagar, Gang Nahar, Modi Nagar, Mohiuddinpur, Meerut Bypass Cut, and Pallavpuram. Realty Projects: Addela Group is developing Rajnagar Residency, a group-housing project which offers 2-, 3-, and 4 BHK apartment of 1,055-2,180 sqft. Showcasing regular design and symmetry, buyers here get to enjoy the best of nature with nearly 75% area devoted to greens and landscaping, according to the developer. K World Group has a group-housing project, KW Srishti, on 10.5 acres. The project comprises 1,300 flats in 1-, 2-, and 3 BHK options. The company plans to give possessions in the first phase in one year, while the whole project is expected to be delivered by end of 2015. The flats are available at the basic selling price of Rs 2,400 per sq feet. KDP Infrastructure is building KDP Grand Savanna, a group-housing project on 12.69 acres; the project offers 1,158 flats in 15 towers in the 1-, 2-, and 3-BHK options, at the basic selling rate of Rs 2,650 per sq feet. The company plans to give possession of the complete project by March, 2014. Along with basic infrastructure in place, the area is well connected to Delhi and nearby NCR areas. The proposed Delhi metro service from Dilshad Garden to Rithala, as well as a new substation, has been approved by the GDA. Want to purchase Flats in Ghaziabad, Email us or SMS: SAVIOUR at 53030.